An assassin for the Manyu clan who was sent to assassinate Chifusa and retrieve the scroll from her possession. She first appears in the 7th chapter and 2nd episode of the manga and anime, respectively. Okami is the owner of an inn where a traveling Chifusa and Kaede decide to rest. Okami used an illusionary technique called "Breast Illusion" (乳夢道 Chichi Mudō? ), which involves shaking her breasts to distract her victims. 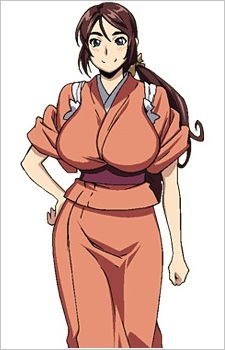 She is not to be confused with Ame Shuji another Manyuu assassin who uses poisonous breast milk and appeared in chapter 2 of the manga but made no anime appearance.